I Your boat a catch and roleaao ayatem With the complete Rope-A-Boat® system, you'll never have to get in and out of your boat to load or launch again. 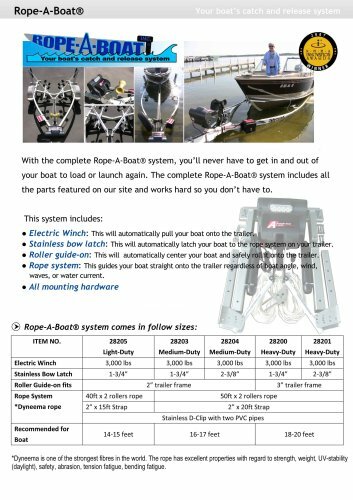 The complete Rope-A-Boat® system includes all the parts featured on our site and works hard so you don't have to. This system includes: • Electric Winch: This will automatically pull your boat onto the trailei • Stainless bow latch: This will automatically latch your boat to the rope system on your trailer. • Roller suide-on: This will automatically center your boat and safely roll it onto the trailer. • Rope system: This guides your boat straight onto the trailer regardless of boat angle, wii waves, or water current. ® Rope-A-Boat® system comes in follow sizes: 'Dyneema is one of the strongest fibres in the world. The rope has excellent properties with regard to strength, weight, UV-stabiiity (daylight), safety, abrasion, tension fatigue, bending fatigue.